12 years of Toybank’s existence called for a big celebration. On the 19th of November 2016, Toybank shared this joyous occasion with 650 underprivileged children through a toy distribution event. At 8 am, 36 volunteers and 11 Toybank team members gathered at Shree Ganesh Vidya School, Dharavi, for a volunteer brief. Shweta of Toybank ran through the do’s and don’ts, providing volunteers useful tips for the event. Following that, the kids started trickling in, each with an energy that got everyone else so excited. The children were assembled in seven different rooms depending on their age group, ranging from 3-15 years. 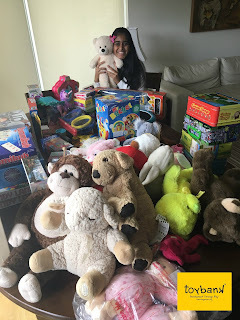 Zaosh Elavia, wonderful Toybank volunteer,shares his experience with us. "An unusually early morning at Dharavi began with a little confusion as we volunteers ended up at the wrong school but eventually found our way to the Ambedkar School where the event was. We were sat down in one of their classrooms and immediately, fond memories of school days came flooding back. The low benches (too small for me now I guess), the messy blackboard and those colorful posters all over the walls made me feel like a school kid again. Once the Toybank staff arrived, things got a little serious. We were given a drill on the activities to undertake, time limits and the entire plan of the play session. It felt like school all over again with teachers handing out strict instructions on how to play!! Hmm, had I signed myself up for fun or some serious work on a Saturday morning when I could be nicely wrapped up in my warm blanket?? However, Shweta's assurance that we were all here to have fun and be kids again made my inner rebel feel at home. We were then divided into groups of 5-6 volunteers per class and told to head to our respective classrooms. I initially headed into classroom number 7 where kids from the 3rd and 4th grade began arriving in large numbers. Immediately, our energy levels went up and our excitement to show these kids a fun time helped us overcome our initial hesitations. We began by asking the kids to say their names out as loud as possible and then started the first activity i.e. pin the tail on the elephant (blindfolded). Immediately, the entire class got involved in guiding the kid who agreed to pin the tail and the ensuing chaos was amazing. The volunteers were egging on the kids to give their best shot and guide their class mates towards the goal. Eventually, we had to ask that only one kid guide the blindfolded participant to ensure the task could be completed. It was great fun for us volunteers as we immediately slipped back to our childhoods and started teasing/distracting the participants while they tried to complete the activity. 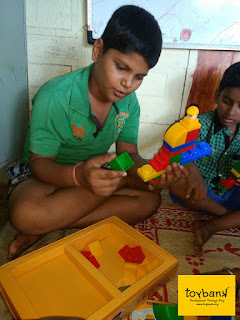 This spirit of fun and revelry continued through all our activities as we then made the kids play the Idli, Wada, Dosa game as well as the other games created for the event (including the singing game, name your interests, etc). It was such a joy to interact with the kids and their energy and enthusiasm rubbed off on all the volunteers as we continued to interact with them. I, for one, felt 10 years younger and 10 times more energetic during these activities and was immediately reminded that we are all so restrained and constrained as adults that we sometimes just forget to be kids again and have fun doing what we do. We become serious, boorish, and even practical. It was such a thrill to be in a classroom with these energetic, enthusiastic young kids who were absolutely having a ball giggling and screaming and laughing their way through all the activities that I immediately realized what a wonderful way it was to spend a Saturday morning! We ended the program by distributing toys to all the kids in each classroom. The happiness on their faces when they realised they were getting a gift to keep was priceless. I don't even remember how the 90 minutes passed! Post the distribution session, we shared our experience. Most of the volunteers present felt that they were converted to kids. We were then given some final views on the work Toybank does and the kind of support it receives from volunteers like us. It honestly felt great to be appreciated for having fun, when was the last time that ever happened? ?A fun group photo-session later, we left taking back some lovely memories and a new-found energy for the weekend ahead. The event was extremely well organized and the energy of the Toybank team of 12 (felt more like 120 people) rubbed off on all of us and ensured we gave our 200%! I could not have asked for a better way to spend a Saturday morning and cannot wait till the next event happens. The thought of spending time in the classroom with kids full of energy makes me thrilled.I looking forward to unleashing my inner child again!"